I was filled with happiness on the day Brendon was born. He is such a bundle of joy. These pictures were taken when he was one day old and I visited him in the hospital. The page is based on sketch #185 from Pencil Lines. 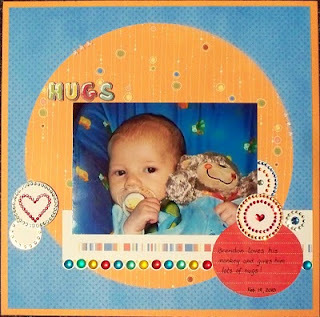 I used a page pack from Pebbles Inc called My Baby Boy. 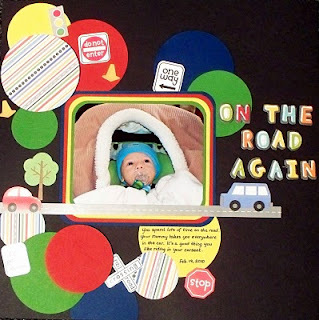 Brendon spends lots of time "on the road" so I wanted to be sure to have a page for his scrapbook showing him in his carseat. Here he is all snuggled inside and ready to go. I used a sketch from Twisted Sketches (#049) and the twist was to use color any how any way. I thought a black background with large circles in primary colors suited this layout. I matted the photo with each of the colors, added stickers randomly throughout, and did the title in dimensional stickers. Brendon loves his monkey. In this photo he was snuggling with his monkey while we were at a crop. I just couldn't resist taking a picture of him and his special blanket. I used sketch #123 from Sketch Inspiration for this colorful page. Bo Bunny's juicy orange popsicle, orange citrus dot, and brilliant blue dot, along with Dana paper from Reminisce were used on this layout. I added bling circles from Me & My Big Ideas along with the large gemstone stickers from Martha Stewart for dimensional colorful accents. The journaling circle is by Reminisce and the letter stickers used in the title are by American Crafts. A couple years ago my husband and I converted a bedroom into my scrapbook room. We put up drywall, painted, added slatwall, tract lighting, carpeting and installed a new window. I realize I am a very lucky person to have a room dedicated to my scrapbooking hobby. I thought it might be nice to share a few pictures of my space so others can see where I create my layouts. I layered several papers from the Princess Bride collection from Rusty Pickle, added some trim and velvet ribbon, stamped a flower with a flourish design then layered the center with a clock I cut from Graphic 45 paper. Now, we have a beautiful baby boy that fills our lives with happiness and joy. This page reminds me of the anticipation of his arrival. This picture of Ryan and I was taken while we were bowling one afternoon in March. There aren't too many pictures of the two of us together so I wanted to be sure to include this in his scrapbook. I used the 4.29 sketch from Sketchy Thursdays for the inspiration for this page using Fancy Pants Designs papers and ribbon from the Summer Soiree collection. I added lots of layers and various punches to add some fun to the page. I even made a little pocket for a bit of hidden journaling and added some glittery rub-ons for sparkle. I'm planning a trip to Great Lakes Mega Meet this weekend with a friend. While we're there we have signed up for a crop at Archiver's. Can't wait to enjoy a weekend filled with lots of shopping and cropping! Hopefully I'll have many more pages to share afterwards. The twist for this week's challenge at Twisted Sketches was "clean". I chose to work with a picture of me as a baby taking a bubble bath. After all, how much cleaner can you get? I used a variety of patterned papers from various manufacturers including Making Memories, Sweetwater, and My Mind's Eye. The solid blue cardstock was sprayed with pearl glimmer mist to add some sparkle and shine. The sheer ribbon along the bottom of the photo was knotted in 3 places and then I added little paper flowers by Prima for the finishing touch. I'm also adding this to the color challenge this month at A Cherry on Top which was to do a blue monochromatic page. Thanks for looking.